Ol’ Big Ears is back! The group stages of the battle for Club football’s most prestigious begins again on Tuesday as Europe’s elite gather to try and dethrone current champions Real Madrid. Real claimed an unprecedented Undecima last year (some would say by the luck of the draw) and will try to defend their crown against the likes of Barcelona, Bayern Munich, Man city and Arsenal. Back to business. Ronaldo will hope to win back to back UCL titles with Real this year. The Champions league and all its glitz and glitterati that teams fight tooth and nail all season to be part of as well as the chance to be crowned Europe’s top club will be hotly contested among old friends and new foes, debutants and seasoned veterans. Pep Guardiola will face a tough group in his debut European campaign with his new club and will be looking forward to going back to the Camp Nou to face the monster that he created. A Barcelona team that he claims plays the best football on earth. Monster. 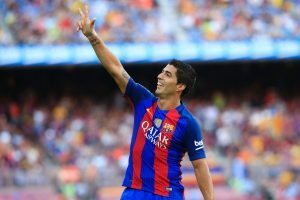 Pep will look at creating an effective strategy to stop the Uruguayan who is firing on all cylinders this year. In what looks like a “group of death,” German dark horses Borrusia Monchengladbach and Scottish champions Celtic would be looking to upset the favorites in the group. Leverkussen can turn to this hitman for goals. 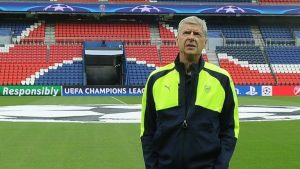 Arsene Wenger returns to his homeland France where he has never lost with Arsenal in a group that also contains French Champions PSG, Swiss Champions Basel and Bulgarian Champions Ludogorets. 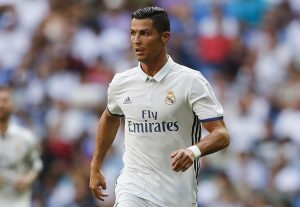 Cristiano Ronaldo also returns to Sporting Lisbon and they will be wary of his record of scoring against all his former clubs in Europe. Legia are Poland’s first representatives in the competition for 20 years and will be hoping to make a good start against Borrusia Dortmund who are back from a one year hiatus and of whom Real Madrid would be wary. Old boy. 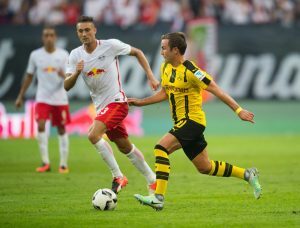 Gotze orchestrated a 4-1 semi final win over Real in his last stint at the club. Back to business? 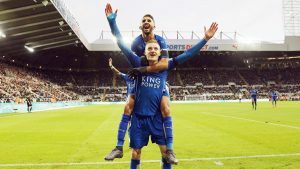 English champions and debutants Leicester City will begin their European campaign in Belgium against Club Brugge in a fair group that includes Porto and FC Copenhagen. Claudio Ranieri of course is no stranger to the Champions league entering his 6th competition with his 6th different club. 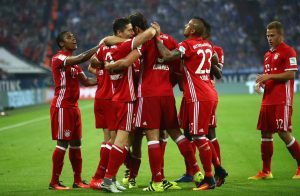 The only other debutants FC Rostov face a daunting trip to Munich to face German Champions Bayern Munich under new management as Ancelotti takes his new team into Europe for the first time. PSV and Atletico Madrid renew rivalries as well after Atletico knocked out PSV on their way to the final in 2014. Bayer Leverkusen host Russian Champions CSKA and Tottenham host Monaco on the back of a 4-0 smashing of Stoke City. 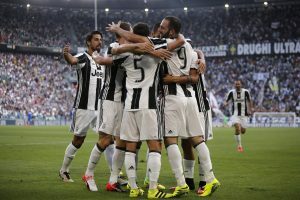 Juventus and Sevilla will also renew rivalries as Sevilla begin life without Unai Emery and Juventus will be eager to continue their 17 game unbeaten streak at home in the Champions league, while Lyon will hope to improve from their previous Champions league campaign when they crashed out at the group stage. Benfica vs Besiktas and Dynamo Kiev vs Higuian-less Napoli are the games which kick off Group B which we will not be watching which is likely to be a closely contested group with teams that are around the same level of quality. Ignored texts and wailing girlfriends (unless he is a Man Utd or Liverpool fan) are about to encounter a sharp increase on Tuesday and Wednesday nights because the Uefa Champions League has kicked into full swing.